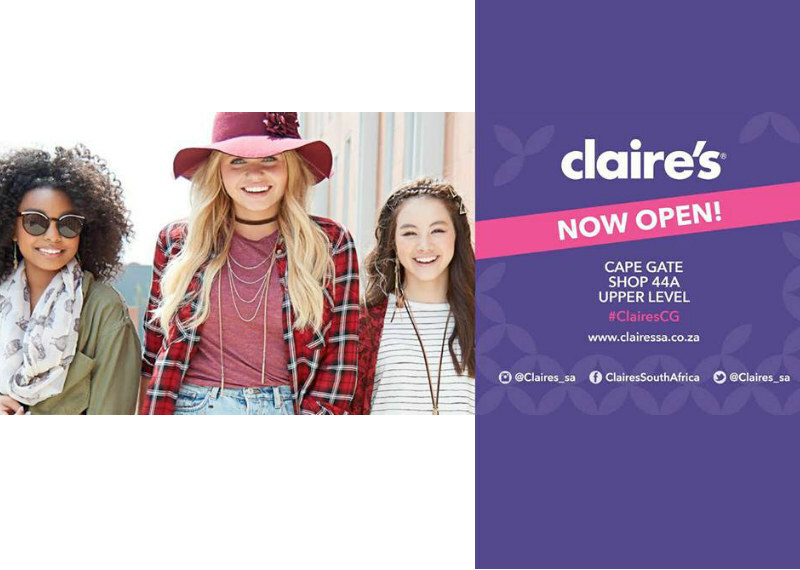 Win a Claire’s Gift Card to the Value of R3000! Stand a chance to win a Win a Claire’s Gift Card to the Value of R3000! Important clauses which may limit our responsibility, place an obligation on you to indemnify us, involve an acknowledgment of any fact or involve some risk for you will be in bold and italics. You must pay special attention to these clauses. 1.1. The Afternoon Express Claire’s Gift Card Competition (Competition) will be run by Cardova Trading (Pty) Ltd in association with Claire’s a division of Clicks Retailers (Pty) Ltd (Clicks);(Collectively the organisers/we/us/our). 2. Competition Period2.1. Entries for the Competition will open at 17h00 on Thursday, 13 October 2016 and will close at 18h00 on Thursday, 13 October 2016 (Competition Period). 4.1. SMS the keyword "CLAIRES" followed by your name, surname and city to 33650 within the Competition Period. 4.2. Once you meet the requirements set out in clause 3 above and this clause 4, you will automatically be entered into the prize draw. 4.3. You may enter the Competition as many times as you like to increase your chances of winning. 4.4. SMS' will be charged at R 1.50 (one rand and fifty cents) per SMS entry. Free or bundled SMS' do not apply. 5.1. We will randomly draw 1 (one) winner (Winner) by means of an automated system within 48 (forty-eight) hours from the closing date of the Competition Period. Late entries will not be considered. 5.2. We will contact the selected Winner within 3 (three) days from the prize draw on the cell phone number from which the entry was sent. If a Winner is not contactable within 3 (three) days from the prize draw, and after we have made at least 3 (three) attempts to contact the Winner, that Winner will forfeit the prize and we shall have the right to select a different Winner on the same conditions except that we shall only be required to make 1 (one) attempt to contact each further Winner drawn. 5.3. Each Winner will be required to provide a copy of his/her Identification Document as required in terms of the Consumer Protection Act, 68 of 2008. If a Winner fails to provide a copy of his/her Identification Document within 3 (three) days from it being requested, that Winner will forfeit the Prize and shall have no claim against us. 6.1. The Winner will receive a Claire’s Gift Card (Gift Card) to the value of R 3 000.00 (three thousand rand) (Prize). 6.2. The Gift Card may be presented as payment for purchases only at participating Click's and Claire’s stores and use of the Gift Card shall be subject to standard terms and conditions for such Gift Cards. 6.3. Purchases can be made using the Gift Card until the value reaches zero. The Gift Card cannot be reloaded. 6.4. The value in the Gift Card is only exchangeable for purchases at Claire’s stores and may not be refunded or redeemed for cash. No cash will be given. 6.5. The Gift Card is valid until the date on which the full value has been redeemed or 36 (thirty six) months from date of issue. Any value remaining on the Gift Card at that date will be forfeited.6.6. The Prize excludes all items not mentioned in clause 6.1. 6.7. We will contact the Winner per telephone to make arrangements for delivery of the Prize, which shall be delivered to the Winner within 30 (thirty) days from confirming the Winner. 6.8. The Prize, or any part thereof, may not be exchanged for cash any other item. Prizes are not transferable. We reserve the right to substitute the Prize, or part thereof, with any other prize of a similar commercial value. 7.1. Any reference to the organisers includes the directors, members, partners, sponsors, agents or consultants of the organisers, where the context allows for it. 7.2. In case of a dispute regarding the identity of a Winner herein, the owner of the SIM card used to enter the Competition will be deemed the Winner, even though the handset may have been used by another individual to enter the Competition. 7.3. The organisers' decision regarding any matter concerning the Competition and/or arising out of these terms and conditions, including the determination of the Winners, is final and no correspondence will be entered into. 7.4. Where relevant, if a Winner does not accept the Prize as required herein, if an entry is not valid for whatever reason, if a Winner has breached these terms and conditions, if a Winner renounces the Prize or we deem such Winner to have renounced the Prize, we reserve the right to declare the Prize forfeited and/or choose a new Winner. 7.5. Nothing in these terms and conditions is intended to, or must be understood to, unlawfully restrict, limit or avoid any rights or obligations, as the case may be, created for either the entrants or the organisers in terms of the Consumer Protection Act, 68 of 2008. 7.6. We will need to process your personal information to validate your entry as well as to contact you to offer you Clicks products and, if you are a Winner, to make the Prize available to you. By entering this Competition, you specifically and expressly consent to us processing your personal information for these purposes and you specifically and expressly consent to Clicks contacting you for marketing purposes. 7.7. We assume no risk and/or liability whatsoever for the failure of any technical element in the Competition which may result in your entry not being successfully submitted and/or the Winner not successfully receiving or taking up the Prize. 7.8. Once the Winners accept the Prize, such Winners accept such Prize voetstoots and at their own risk. 7.9. We assume no liability whatsoever for any direct or indirect loss, harm or damage arising from your participation and/or any use of the Prize awarded in terms of the Competition. All persons, entering this Competition, indemnify and hold us harmless for any loss, damage, harm, death or injury (whether arising from negligence or otherwise) which may be sustained as a result of his/her participation in this Competition and/or his/her use of the Prize, or the use of the Prize by a third party.7.10. If required by the Minister of Trade and Industry, the National Consumer Commission or for whatever other reason, we will have the right to modify or terminate this Competition with immediate effect and without notice of such modification or termination. In such event, all entrants hereby waive any rights, which they may have against us and hereby acknowledge that they will have no recourse or claim of any nature whatsoever against us.